OptiSurface In Press: OptiSurface User Wade Bidstrup Shares His Experience – Welcome to the OptiSurface Support Center! Author: Clarisa CollisWith rain soaking into his faba bean crop, Central Queensland grower Wade Bidstrup paused to explain his soil-focused efforts to improve productivity in his western Darling Downs grains enterprise. Over the past 18 months, the Bidstrups – Wade, his wife Sally, his parents Jeff and Marilyn, his brother Brett and sister-in-law Rebecca – have been using GPS to laser-level the cropping areas on their property at Warra, 45 kilometres north-west of Dalby. To date, they have used this precision approach to level 1200 hectares, creating an even soil surface with a minimum 0.05 per cent gradient to improve paddock drainage and reduce the risk of water logging. Wade says about 40 per cent of their 3000ha is prone to waterlogging in wet seasons. In 2011 and 2013, the tendency for their heavy, grey clays to become inundated wiped out half the family’s summer crop. However, mostly dry conditions since they started using GPS levelling, following the March 2013 floods, have made it difficult to undertake a cost-benefit analysis of this investment. That aside, there has still been enough improvement in drainage for the Bidstrups to harvest about 20 per cent more sorghum from a GPS-levelled area following another flood in March this year – enough, Wade says, to be confident the investment is already paying off. To set up the GPS levelling, the Bidstrups initially invested $50,000 in its two main components: Trimble® computer hardware and an OptiSurface® software program. Wade says the OptiSurface® program draws on existing elevation data to generate new ‘suggested elevation maps’ to optimise drainage across paddocks. The new elevation maps for each paddock are then fed into the Trimble® hardware in the tractor cabin, which guides the levelling works. The trade-off for this added precision is that the GPS approach is more expensive and labour-intensive than the method previously used by the Bidstrups. In the past, they towed a grading blade or ‘land plane’ behind a tractor to smooth the surface of their cropping area. While this method cost a fraction of the $120/ha cost of cutting and filling their paddocks with GPS, Wade says it failed to remove all the depressions and ridges in the soil that caused waterlogging losses. Overlapping the family’s focus on making the soil surface more productive is a complementary strategy targeting the soil profile. 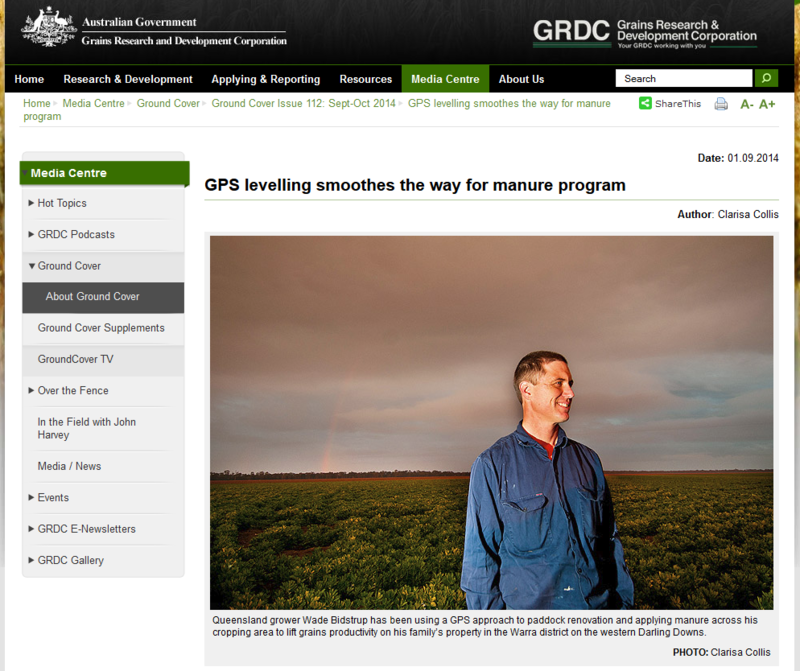 The Bidstrups have been using the GPS-levelling works as a catalyst for spreading and incorporating manure. By timing their manure spreading to occur after they renovate a paddock, they have been able to use the process of cultivation required following levelling to incorporate the manure. This allows them to cut back on cultivation, minimising soil disturbance and maximising the efficiency of their efforts to resurface the remaining 1800ha, which they plan to do in the next two years. Wade says spreading manure across 40 per cent of their property at three-year intervals for the past 12 years has been aimed at scaling back their use of conventional fertiliser, particularly starter fertiliser containing phosphorus, potassium and zinc. He says the manuring has provided “large improvements” in the soil’s phosphorus, potassium and zinc levels, which have led them to stop using starter fertiliser. “However, we still apply conventional nitrogen fertiliser, as we don’t get enough nitrogen out of the manure to meet crop demands,” Wade says. Queensland Department of Agriculture, Fisheries and Forestry researchers are running trials on the Bidstrup property, in part to assess their manuring program. Wade hopes the on-farm trials looking at manure and conventional fertiliser applied on the soil surface and deep in the soil profile will give them a clearer picture of the best place to apply nutrients, and the cost-benefits of the manuring program as a whole. The cost of carting the manure about 60km from a local cattle feedlot is about $5 per tonne, while the total outlay on purchasing, spreading and incorporating it is about $35/ha. The job now is to determine what the pay-off is in grain yield.